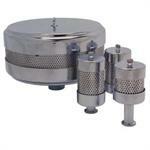 Modern vacuum pumps for maximum process reliability re-quire mature ﬁlter technology in OE quality. 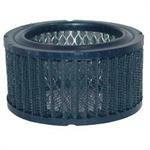 For Multifactor Europe like MANN-FILTER, OE quality is not just a buzz word, but tried and tested ﬁlter know-how. 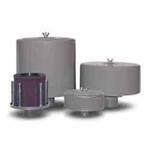 MANN+HUMMEL have been active in the development and manufacturing of ﬁlters for vacuum pumps for more than 60 years. Every year, around 4 percent of the total revenue ﬂows back into research and development. The service lives of the ﬁlters used show a premature rise in pressure and lead to increased power consumption of the vacuum pump. 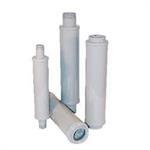 Non-OE quality ﬁlters compromise downstream ﬁlters in such a way that these fail and need to be serviced prematurely. We offer a variety of solutions to remove potentially harmful liquid, sludge, and particulate from the inlet of a vacuum pump. 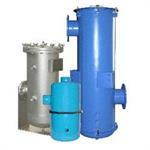 The LRS and SRS Series is an integrated liquid separator and inlet vacuum filter. 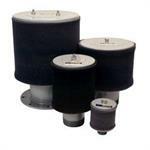 This solution simplifies vacuum packages, combines two functions into one and can be configured to meet your needs. 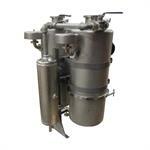 For those that needed a compact liquid separator only the STS Series is designed for you. The STS Series is a liquid separator with a see-through housings that makes visual inspections possible while knocking out potentially harmful liquid and sludge. 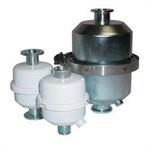 SpinMeister Inlet Vacuum Pump Filters: The SpinMeister used in conjuction with ST or CT Series is for those extreme duty applications with highly dirty environments. This two stage system has an initial stage precleaner to remove the larger particles and then a primary stage filter element. 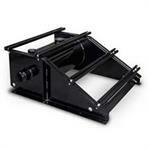 The SpinMeister Series increases the life of the filter element and reduces your costs and potential downtime. ATEX registration allows the design, manufacture, and marking of inlet filter silencers, inlet filters, inlet vacuum filters, integrated liquid separators/vacuum filters and air/oil separation filters for non‐mining applications. BAE Series: oil mist eliminators are designed to prevent seal leakage, eliminate oil mist emissions and reduce oil consumption. 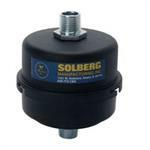 These units also protect your gearbox, crankcase or oil lubrication system by eliminating pressure build-up in the system. These designs are commonly used on lubricating oil systems for high-speed rotating equipment, like gas turbines, steam turbines, turbo compressors, reciprocating engines and gearboxes. 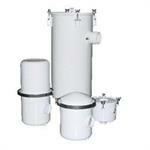 Comply with the latest RICE NESHAP Emission Standards. 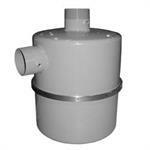 Reduce the footprint of PD blower packages with this premium silencer filter. The 2G series is designed with an integrated reactive/absorptive silencing technology that incorporates sound absorbing material, noise deadening and multiple silencing tubes. 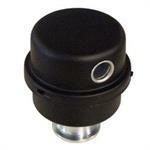 The QB series uses a reactive silencing design. 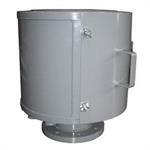 Industrial, severe and extreme duty models are available. 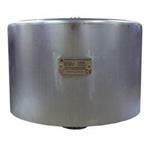 Find out more about stainless steel assemblies. 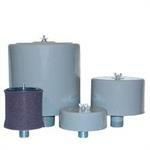 These heavy duty and severe duty particulate filters utilize high efficiency polyester elements. 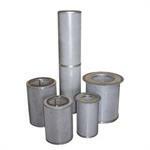 The filter elements can withstand oil and are washable. 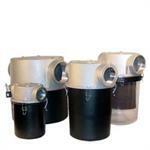 Find out more about how these filters can be configured to meet your needs. EFS Series: Dry vacuum pumps discharge noise and tip seal dust, Exhaust Filter Silencer captures this dust while muffling unwanted discharge noise. The housing offers an unique integrated diffuser inlet connection. 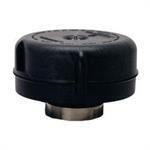 It is designed for minimal pressure drop and high efficiency. 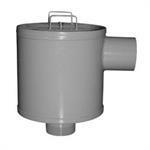 LQB Series: Lateral Access Filter Silencers, help make enclosures feasible and simplifies the maintenance process. 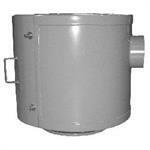 The side access port allows sound enclosure's overall height and cost to be reduced. 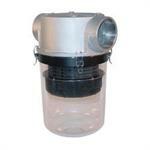 SpinMeister Precleaners: Extreme duty filtration when combined with a inlet filter. BBF Series: Find out how you can reduce the overall size of your PD blower package, minimize labor and assembly time, and build your sound enclosure competitively. 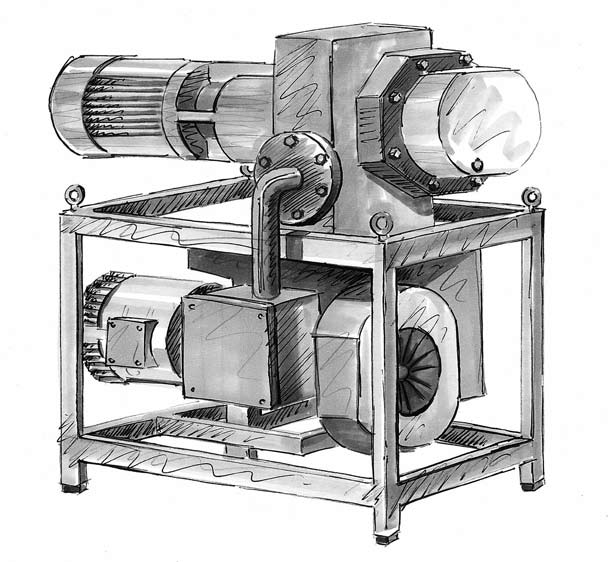 We also offer engineering assistance and base frame package layout schematics to better help you layout your blower package. 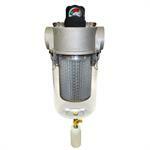 Scrubber assemblies are used to protect gas compressors from fine particulate and condensate. 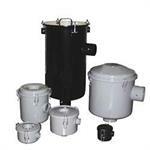 We provide both vessels and filter elements for these applications. 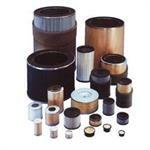 Micron efficiencies vary dependant on the contaminants present in the gas stream. 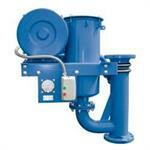 Without proper filtration, compressor performance is reduced. 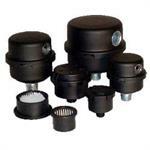 Units can offer customized solutions to match the specific conditions. More information coming soon. 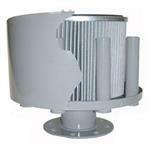 Full line of replacement elements for all filter assemblies and many nonstandard and competitive elements available.